Durango, Colo. – (July 18, 2018) – The Durango Area Tourism Office (DATO) is pleased to announce Budget Travel has named Durango one of America’s Coolest Small Towns. Each year Budget Travel, an award-winning travel website, searches for towns with a population under 20,000 that offer haute cuisine, natural beauty, a vibrant community spirit, and cultural diversity. There is steep competition to secure a coveted spot on the list, and Durango was the only Colorado town selected this year. 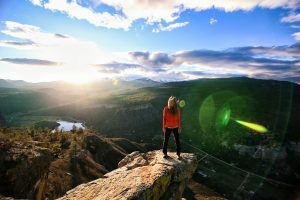 Budget Travel praises Durango for its abundance of outdoor activities, outstanding downtown with award winning restaurants, theater, music, art galleries, varied lodging accommodations, and the historic Durango & Silverton Narrow Gauge Railroad. Selected as the town for southwest adventurers, Durango offers vacationers a nearly endless choice of outdoor activities, dining, cultural and historic attractions. The Durango area is Southwest Colorado’s premier four-season destination, attracting more than 600,000 visitors annually. For information about the Durango Area Tourism Office, please visit Durango.org. Budget Travel inspires and empowers American travelers who want to see more for less by providing consumers with ‘how-to’ advice to get the most out of each travel experience, and make every destination accessible. With an aspirational and friendly approach across all platforms (including digital, social, video & TV), Budget Travel delivers the best advice on vacations, long weekends, and road trips in the U.S. and beyond (www.budgettravel.com). The Durango Area Tourism Office (DATO) is an independent non-profit organization operating with the mission to promote Durango and La Plata County’s multitude of tourism attractions, events and services. The unbeatable combination of the iconic San Juan Mountains, art galleries, culinary fare, cultural and historic sites make it the perfect base of operations to explore Southwest Colorado. Visit DATO’s full-service Welcome Center, located at Main Avenue and 8th Street in the heart of historic downtown Durango, or online at www.durango.org. Follow @visitdurango on Facebook, Instagram, Twitter and Pinterest.